For those who like to hike light, a new spring release from the University of North Carolina Press could be the only guidebook you’ll need this season. 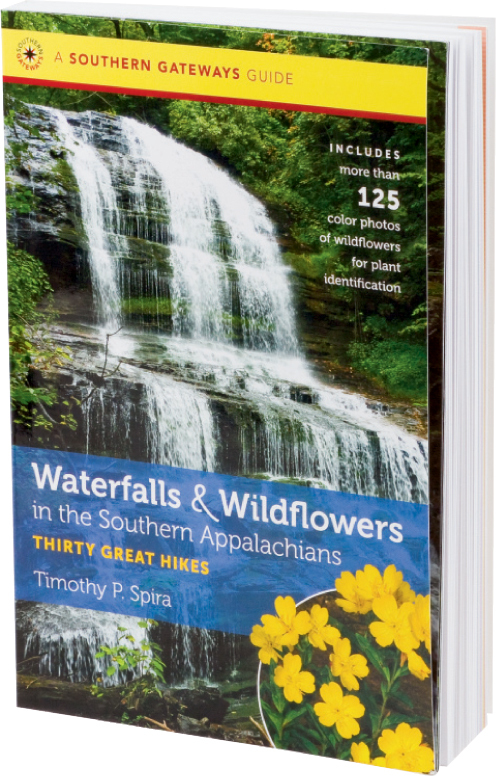 Waterfalls & Wildflowers in the Southern Appalachians combines maps and directions with plant IDs and other useful insights. Discover cascades and botanical wonders throughout Western North Carolina, plus a few bonus spots in Virginia, Tennessee, and South Carolina. Author Timothy Spira provides detailed descriptions of 30 popular hikes throughout the Great Smoky and Blue Ridge mountains, ranging from short strolls to an eight miler. With background information on the surrounding vegetation, the book explains the region’s forests. An entire section devoted to plant community profiles clarifies the development of heath balds, several types of forests, and waterside areas such as spray cliffs. Perceptive trail descriptions provide maps, photos, directions, and a list of plants you’ll see along the way. And in the back of the book, wildflower profiles—organized by bloom color—elaborate on the species from the lists.